If ever there was a landscape that could be rendered perfectly in the natural colors of sheep wool, it would be “Large Tree Group,” an oil painting of a shepherd traipsing toward large trees in an overcast snowy field. The front of the tapestry hanging in an Edinburgh studio gave visitors a scene from a Scottish shepherd’s stoic life. 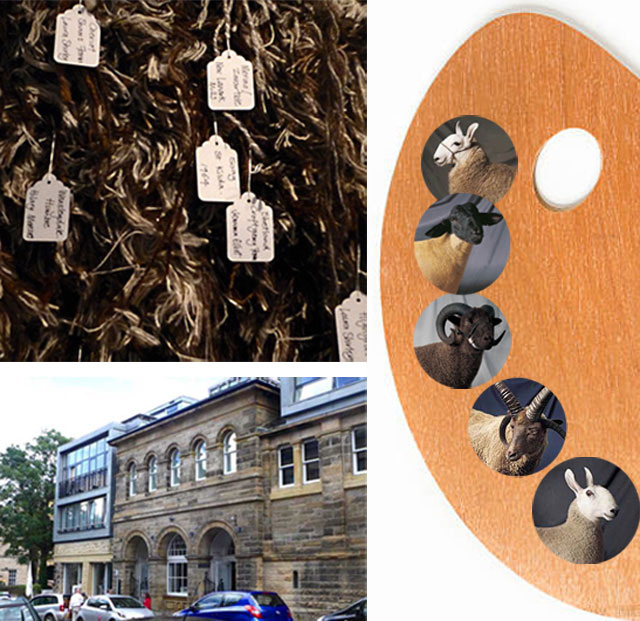 The back, if you wandered around behind, is about the sheep: The artists tagged each color of undyed yarn, shown below, with the names of Merinos, Cheviots, Wensleydales, Shetlands and other breeds that contributed their wool. Lower photo: Dovecot Studio’s quarters in Edinburgh. The heavy, ruglike tapestry, 9 feet wide, loyally adapts an oil painting — one of a series done by British artist Victoria Crowe during the 1970s. Crowe documented the daily life of the late Jenny Armstrong, her aging neighbor and friend who was then winding down her shepherding career in the Pentland Hills southwest of Edinburgh. The shepherd paintings filled a need for Scotland’s National Portrait Gallery. The curators had plenty of famous faces. They were keen to display more pictures paying tribute to ordinary Scots and their hard, productive, officially revered lives. 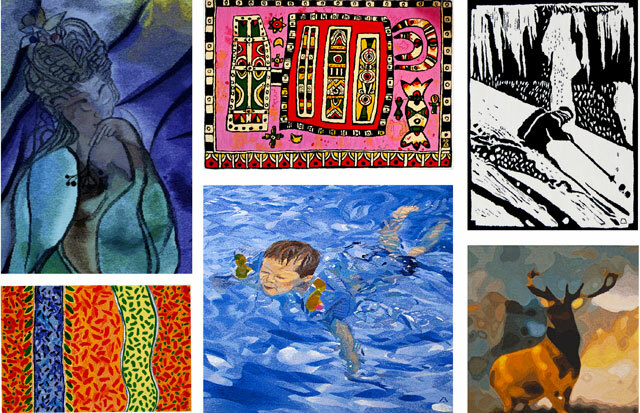 The gallery’s 2000 exhibition of Crowe’s paintings led, in turn, to commissioning of the tapestry that debuted in 2013 at Dovecot Studios, Edinburgh’s century-old proponent of textile arts. 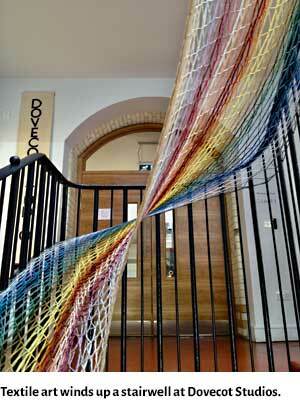 Dovecot artists David Cochran and Naomi Robertson wove the piece. The public had recently been reminded of the range of natural wool colors grown by various breeds. Starting in 2008, photographers produced flocks of popular books and pin-up calendars showing clean, good-looking sheep in formal poses. Volumes of beautiful pig and duck portraits followed. Dovecot went with the idea, prompting 70 farms and spinners to provide undyed wool for the tapestry. It was displayed at first at Dovecot’s home in a repurposed 1885 public bathhouse in Edinburgh’s Old Town, a block east of South Bridge. In 2018, news reports say Scottish curators are still on an Everyman kick. “Large Tree Group” is now on display in the National Museum of Scotland. But attending to human diversity may not be enough. Now that class-action lawsuits are allowed in Scotland, as of June 2018, we can await the day when lawyers representing the sheep of Scotland will protest that their personal colors, not to mention their wool, were taken without their consent. Our Scotland visit extends into the Highlands and to a reindeer farm. For credits and more info on Dovecot tapestries pictured above, choose by title. Top row: The Caged Bird’s Song, Celtic Spirit II, and Ski Rug. Lower row: William Crozier Untitled Rug 2010, Waterbaby, and After After After Monarch of the Glen, an update of Scotland’s famed image of a rampant stag. More photos of Edinburgh and the Highlands.